Shinji by Kanesaka at Carlton Hotel struck more than gold at this year's Straits Times and Lianhe Zaobao's Best Asian Restaurants Awards. The restaurant not only won the gold award again in this second edition of the annual awards to honour the best in Asian dining in Singapore. Its master chef Koichiro Oshino also bagged the Chef of the Year title, and the Shinji outlet at St. Regis hotel repeated its silver win. The other two gold winners are Imperial Treasure Fine Teochew Cuisine at Ion Orchard, and Summer Pavilion at The Ritz-Carlton, Millenia Singapore. The awards, held last Monday, also ranked 22 restaurants silver and 29 bronze. A total of four personality titles were given out. Judges were The Straits Times' Life editor Tan Hsueh Yun, deputy Life editor Wong Ah Yoke and food correspondent Eunice Quek as well as Lianhe Zaobao food correspondents Marcus Yeo, Ng Chin Chin and Ng Yimin. The annual awards programme is part of Asian Masters, a year-long gourmet festival that kicked off last month and will continue with dining and cocktail promotions until next February. Asian Masters is organised by Sphere Exhibits, a wholly owned subsidiary of Singapore Press Holdings, and F&B consultancy Poulose Associates. The Sunday Times speaks to this year's gold winners. With its posh ambience complete with Italian hand-painted porcelain tableware, Cantonese fine-dining restaurant Summer Pavilion is not quite the place you would expect customers to order fried hor fun. But Chinese executive chef Cheung Siu Kong, who made Poached Rice With Lobster Meat one of the restaurant's signature dishes, has no qualms frying up hor fun with beef and bitter melon in black bean sauce. The staple is in the rice and noodle section of the restaurant's menu. Located at The Ritz-Carlton, Millenia Singapore, the restaurant clinched a silver award last year and won gold at this year's Best Asian Restaurants Awards. The Hong Kong-born Cheung, 49, says in Cantonese: "People might wonder, why pay five times more for a dish that you can eat at a coffee shop? But the dish is a classic Cantonese dish which allows us to showcase our skills by producing hor fun with wok hei. The difference is also in our presentation, the service and overall dining experience." Mastery of basic cooking techniques is an ongoing process for the chef and his kitchen team of 20. He joined the restaurant in 2003 as assistant Chinese chef and was promoted to his current position in 2014. The restaurant, which opened in 1996, relaunched in November 2015 after a seven-month revamp. It was awarded its first Michelin star in 2016 and was again awarded one star last year. Chef Cheung takes the pressure of winning and customers' rising expectations in his stride. "We focus on continuously perfecting our foundational cooking techniques such as steaming fish to the exact doneness, control of the fire to achieve the best wok hei and simmering stock," he says. His persistence stems from the work philosophy he picked up at Lei Garden prior to joining Summer Pavilion. "I learnt to cultivate a clear mindset and not let negative thoughts get in the way," he says. He also picked up the "four virtues" of persistence, determination, confidence and humility. He works with the restaurant's management and service staff to design new tasting menus every quarter, with dishes such as Poached Rice With Alaska Crab Meat, Crab Roe And Lobster Broth. Mr Nicolas Bailet, 42, executive assistant manager of food and beverage at the hotel, says: "Chef Cheung seeks perfection in his culinary craft and inspires his team to deliver their best every day." Customer service at Summer Pavilion lies in anticipating and understanding the needs and wishes of guests, Mr Bailet says. "Small gestures such as remembering guests' dietary restrictions make all the difference in service delivery." The service and culinary teams undergo regular training and attend internal food and beverage tastings so they have the knowledge to describe and recommend dishes and beverages to customers. Chef Cheung says: "It takes our entire team of chefs and service staff working together to create the best experience for our guests." How did a restaurant group, whose founder built his reputation by providing authentic Hong Kong-style Cantonese cuisine in Singapore, find success in other styles of Chinese cuisine? Imperial Treasure Fine Teochew Cuisine at Ion Orchard went from winning bronze at the inaugural Best Asian Restaurants Awards last year to bagging one of three gold awards this year. It also snagged its first Michelin star last June. Its sister restaurant, Imperial Treasure Fine Shanghai Cuisine, is also a winner at this year's Best Asian Restaurants Awards, though it slipped from last year's gold category to silver this year. The group has 25 outlets, of which 17 are in Singapore. The rest are in South Korea, Hong Kong, Guangzhou and Shanghai. Hong Kong-born restaurateur Alfred Leung, who was last year's Lifetime Achievement Award winner, opened the group's first outlet, Imperial Treasure Teochew Cuisine at Ngee Ann City in 2004, after leaving Crystal Jade which he started with his brother-in-law in 1991. 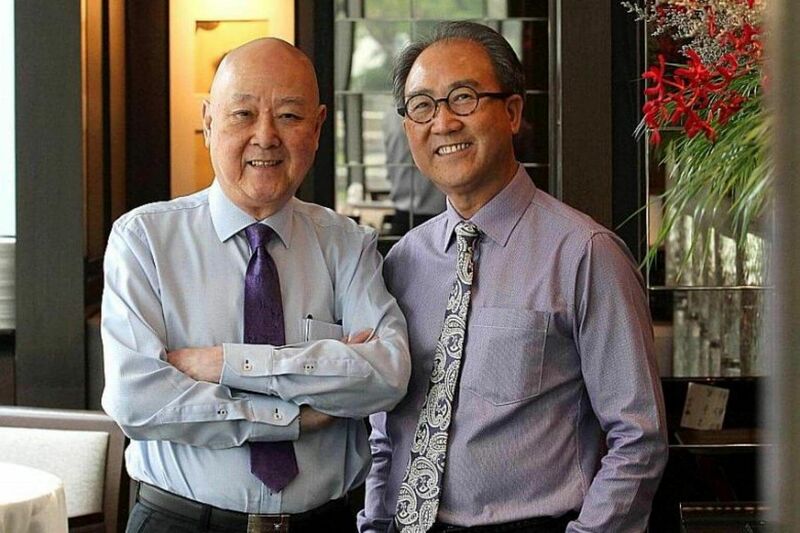 Mr Leung's elder brother Jimmy, 75, and younger brother, Vincent, 61, moved to Singapore in 1991 to help him - first at Crystal Jade, then at Imperial Treasure. Jimmy is the group operations manager while Vincent is the F&B operations manager. The brothers' love of different cuisines is tied to their family's roots in Singapore. Their paternal grandparents were Singapore-born Peranakans who moved to Hong Kong before World War II. Their mother was a Hong Konger. Jimmy says: "Our grandmother cooked Peranakan food such as curries, while our mother cooked very good Cantonese food." In 1981, when Alfred had the opportunity to work at the Happy Valley restaurant in Singapore, he took it. Jimmy says: "Our family always had an interest in Singapore as our father used to speak fondly of growing up in the Bukit Pasoh area, and tell us what he remembered about Chinatown and other parts of Singapore." Between 1993 and 1994, his parents decided to move to Singapore as all three brothers were working at Crystal Jade in Singapore. Jimmy, who started working in F&B in Hong Kong at age 19, says: "When Alfred decided to open Imperial Treasure Teochew Cuisine, the concept was to serve Hong Kong-style Teochew cuisine in an elegant setting. "We noticed that local food here tends to be sweeter compared to Hong Kong-style Teochew cuisine, which is more savoury, with use of condiments like chu hou paste." Chu hou paste is a soya bean-based sauce that contains garlic, ginger and sesame seeds. Imperial Treasure Fine Teochew Cuisine is the more upmarket replacement of the Ngee Ann City outlet, which has closed. At 9,000 sq ft, it is nearly double the size of the old restaurant. A new outlet also opened at Tanjong Pagar Centre last year. Jimmy says Alfred's attention to detail extends to having the tables generously spaced apart so that customers can have more privacy to talk while dining. The restaurant's signature dishes include Chilled Red Flower Crab In Teochew Style, Diced Abalone And Chicken Wrapped With Egg White and Wok Fried Hor Fun With Diced Kai Lan And Preserved Radish. Fresh ingredients such as sea whelk are sourced from Hong Kong and air-flown in weekly. Vincent says: "As operations managers, we have to set an example. Even when I am overseas, if a regular customer calls me to make reservations, I will make the necessary arrangements. There is no such thing as asking the customer to call the restaurant manager instead. "This business is also about our customers. For them, we must give the best service." On Imperial Treasure's winning streak, Jimmy says: "The food has to be good and service must be up to standard. Good fortune may last only a day. Our business is about the effort and hard work of everyone on our team every day." Starting a restaurant was never their plan, but a visit to Tokyo's renowned Sushi Kanesaka set married couple Ong Kian Min and Joni Ong on the path to becoming co-owners of two high-end outposts of the restaurant in Singapore. Mrs Ong, who runs her own HR consultancy, and her corporate lawyer husband, both 57, opened Chef Shinji Kanesaka's first restaurant outside Japan in 2010 at Raffles Hotel. It moved to its current location at Carlton Hotel last year. Shinji by Kanesaka at Carlton Hotel, which has one Michelin star, was ranked gold again at this year's Best Asian Restaurants Awards, while its sister outlet at St. Regis Singapore kept its silver ranking. Shinji's master chef Koichiro Oshino, 48, also won the title of Chef of the Year. Mrs Ong and her husband first met sushi master Kanesaka at his Ginza restaurant in 2009. A business associate of Mr Ong's had told him about the chef's interest in expanding to cities such as New York and London. So during the couple's holiday in Japan in August 2009, they met chef Kanesaka who hosted them to lunch. Impressed by his style, Mrs Ong blurted out, "What about Singapore? ", when Chef Kanesaka mentioned that he wanted to expand his business overseas. She says: "At that time, I was not considering becoming a partner for his overseas outpost. I simply wanted to enjoy his sushi in Singapore." Three months later, chef Kanesaka's representative contacted the couple to ask if they could host him during his visit to Singapore in January 2010. Mr Ong then offered to help find investors for Kanesaka's first overseas outpost in Singapore. Mrs Ong says: "My husband prepared a list of potential locations, including Raffles Hotel, which was looking for a tenant to take over the space occupied by Doc Cheng's." Without Mrs Ong's knowledge, her husband signed a contract with Raffles Hotel because he was confident about securing investors for the restaurant. But the market was not doing well and he could not find any interested parties. The couple ended up investing $1.5 million in the restaurant themselves. The first outlet opened in Raffles Hotel in 2010 with Oshino as master chef. A second one opened at OUE Tower, later moving to its current location at St. Regis. Mrs Ong says: "Our inexperience in the F&B business worked in our favour because we went into the business from the diner's point of view. We thought about what we liked and did not like as customers and applied this to how we managed and ran the restaurant." One example was putting prices in the menu, which is not done in the outlets in Japan. For lunch sets, prices start at $75 for nine pieces of sushi with soup and dessert. The Chef's Special starts at $300. Mrs Ong meets master chef Oshino once a fortnight to discuss the restaurant's operations and menu. Chef Oshino headhunted his former colleague at Tokyo's Kyubey, Shunsuke Yoshizawa, 33, to join him when the first Shinji outlet opened. Chef Yoshizawa is now head chef at the St. Regis Singapore outlet. While both outlets maintain the standard set by chef Kanesaka, there is room for each chef to express his own style in crafting sushi. Chef Oshino says: "Our approach to sushi is like jazz. We improvise and add our own style." Mrs Ong says the awards were stowed away after the chefs and service staff celebrated the wins together. Chef Oshino says: "The awards are for our good work in the past. Our focus is on the next customer. We are only as good as the next dining experience."